On November 4th, 2018, I ran the 2018 NYC Marathon, as a proud representative and member of CHRC. It was my first marathon (of hopefully many), and though I’d spent the previous eighteen weeks in training, I believe that nothing can truly prepare you for the excitement and uncertainty of race day. I entered the race with the general goal of finishing, a more specific goal of feeling okay while finishing, and a (kind of unrealistic) goal of finishing in under 5:00. I achieved one and a half of those goals. I gained entry to the 2018 NYC Marathon through NYRR’s 9+1 program. 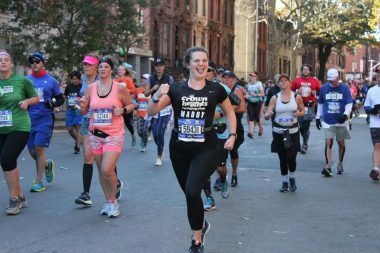 I had initially set out to complete the 5-borough series in 2017 with a friend, but as I tagged along on her training runs in preparation for the 2017 NYC marathon, I was inspired to enter the 2018 race myself. I tacked on four more short runs and one volunteer session in late 2017, and I was in! I started off race day morning feeling tired. Waking up at 6:00 AM, I tried to keep my mind off the long journey ahead. I had gone to bed early the night before, with a belly full of pasta, but nerves had prevented me from sleeping well. Making the trek to the start village in Staten Island was the first hurdle: taking the subway to the ferry to the shuttle bus and then entering the village itself would have been nearly impossible without the support of the other CHRC 7:30 ferry-riders. Paradoxically, the frenetic energy of the other runners in transit helped me forget my own nervousness and stay in the moment. When the shuttle bus got stuck in traffic, I chatted with Heather, Brooke, Kelly, and Zoe, while sipping my coffee. We disembarked the shuttles at around 10:00 – one hour to go until the start of Wave 4. Heather and I explored the blue village – we hung out with therapy dogs, grabbed some free coffee and gatorade, and nervously reapplied sunscreen before parting ways to join our respective corrals. I shed my outer layers into the donation bins – I was chilly but knew that wrestling with layers while running would prove too stressful. All too soon, the corrals collapsed and we started moving forward. I was caught between dual feelings of excitement and dread. Realistically speaking, I had 5+ hours of running ahead of me. I knew intellectually that I was well prepared, but I still struggled with doubt and fear of the unknown. The longest I had ever run was 20 miles – the final 10k of the race would be uncharted territory. As the 4th wave moved eagerly forward to the start, we crested over a bridge and emerged from the cover of trees into full view of the Verrazano Narrows bridge. The sun shone brightly over the crowd, and I could just barely hear Frank Sinatra’s “New York, New York” playing at the start line. As my part of the wave edged closer to the start, everyone broke into an eager trot – by the time we crossed the start line, I was at an easy, comfortable jog. I started my watch and took a deep breath. The race had began. I spent the first few miles of the race smiling from ear to ear. The wind over the bridge was brisk, but I quickly warmed up. I switched from music to a podcast – Last Podcast on the Left – because I was running unaccompanied and missed the easy banter of chatting on long runs. I quickly took out my headphones after crossing the bridge, however, in order to fully take in the sights and sounds of Brooklyn. In those early miles, every funny sign brought a smile to my face. I was delighted to hear sidewalk bands playing pop punk from my teen years, and found myself hooting and hollering like a madwoman every few minutes. In retrospect, my emotional buoyancy early on was not destined to last. At mile eight, I hit my first planned cheer station. Although I knew exactly where to look to find my friends and family, the effort required to scan faces in order to find them was exhausting. I was too caught up in the pack to stop, so once I saw my cheerleaders, I kept moving. Up next was the CHRC cheer station at mile nine. There was one issue, though – I didn’t know exactly where they were located or on what side of the street. As I was running, I pulled up the day’s instagram post and tried to memorize the surrounding buildings from the picture. I continued on through beautiful Clinton Hill, taking in the golden leaves in the trees while maintaining a comfortable, strong pace. When I finally caught sight of a few bananas soon after the 9th mile marker, I sprung into a full, goofy prance. I bounced jauntily past the crowd, feeling ebullient and energetic from the cheers and support. I marveled at the fact that I had run nine miles but still felt relatively fresh. Soon after the cheer station, though, the mood of the race quieted down. We were passing through South Williamsburg and the sidewalks were relatively empty: since Sundays are work days for the Orthodox Jewish community, the only people out were hurrying by on errands and paying little mind to the runners. During this time, I focused on my podcast and thought ahead to my next moral support station: a friend would be cheering from Williamsburg. As I entered Williamsburg proper, the streets slowly filled again. I began to recognize favorite restaurants and bars, and kept my eyes open for my friend. However, the effort of scanning the crowd for familiar faces began to drain me. I caught sight of my friend and managed a quick hug before jumping back in again, but something felt off. My stomach was churning from the last Gu I’d taken and my left knee was starting to twinge. Right before crossing the bridge into Queens, I took a bathroom break, thinking I just needed a moment to reset at the half marathon mark. I don’t remember much of Queens other than continuing to feel uncomfortable – both knees were kind of hurting, which was making me nervous. My stomach still felt weird, even after stopping for extra cups of water. By the time we started up the incline of the Queensboro bridge, my emotional state began deteriorating as my knees seized up. I switched from my podcast to a playlist of upbeat music, but that just made me feel disappointed in myself when I had to pull over to the side to stretch and shake some life back into my knees. I was frustrated that I was in such pain, while the people around me still seemed to be going strong. I made a deal with myself: I would walk/jog the rest of the incline then start running again after cresting the top of the bridge. However, even after starting downhill, my knees still hurt – a lot. At that point, I resigned myself to the thought that this pain was not going away for the foreseeable future, and I would have to find a way to work around it in order to finish. Entering 1st avenue at 59th street was truly like hitting a wall of sound, as it’s so often been described. The energy there helped me forget my knee pain for a while. I also had friends and family to look out for around mile 18, so I tried to keep my head high in preparation. I order to soothe my knees, I started walking each water station and spending one minute walking after each mile marker. My hope for negative splits was out the window. This new strategy gave me some energy back and allowed me to fully appreciate seeing my moral support system. However, as soon as I’d passed them, I was on my own again. I stupidly began counting down the miles. I had 8.2 left. It felt like an insurmountable amount. By the time I entered the Bronx, I felt emotionally spent. The onlookers cheering and the school marching bands on the sidelines confused and infuriated me. I was so tired, and rather than energizing me, the flurry of activity surrounding the race course just made me feel scattered. Insidious, defeatist thoughts entered my head. Rather than reveling in the experience, living in the moment I had trained for, I began to just wish it were all over. I could feel how dangerous it would be to mentally give up on myself before the race was through. I can’t say for sure what helped me keep going. Perhaps it was a combination of things. When I passed back into Manhattan, the miles left to go suddenly felt manageable. The supportive texts that had been popping up on my watch all day were coming faster now – “welcome back to Manhattan!” and “almost there!” At 90th and 5th, I saw Áine on the sidelines. She gave me gummies and told me I looked strong. I nearly broke down in tears right there. At that moment, I felt anything but strong. Near the Met, I saw my parents one last time. They were ringing these ridiculous giant cowbells and when I came into view, the entire crowd surrounding them began cheering too. My knees weren’t hurting so much anymore. I was close to finishing. I sped up. I used an 18-week training plan, sent to me by CHRC’s own Liz Marvin. I edited the plan to fit in NYRR races and official long runs, and somewhat modified the mileage according to Hal Higdon’s beginner marathon training plan. Once I finished tweaking it, the plan called for long runs every weekend, maxing out at 20 miles, with 3-4 days of midweek easy running. Ideally this would have amounted to 537 miles over the training period. However, though I prioritized training this summer, life still managed to get in the way. I skipped two long runs and quite a few more midweek runs due to illness, vacation, or just plain laziness. My total training mileage ended up being 386 miles with an average of 25 miles/week. Who’s to say if those skipped runs would have made for a more enjoyable race, but at the end of the training cycle I still felt well prepared. My general goal was to finish, but I was 99% sure that was achievable. I also hoped to finish feeling strong, which I only partially accomplished. Finally, I was hoping for a sub-5 hour finish, which seemed feasible based on my half marathon times, but (mostly due to knee pain) I did not meet that goal this time. My finish time was 5:14:53. I ran most of my long runs with CHRC on saturday mornings. Initially, I was apprehensive about joining the long runs because I am on the slower side – 10:30 to 11:00 pace when running long. However, I found the run leaders to be incredibly supportive of my leisurely pace and they made great accommodations that allowed me to catch up with the rest of the pack at regular intervals. On smaller group runs, run leaders kindly slowed down to my pace and chatted to me as I broke new personal records. I ran my first 15-, 16-, 17-, and 20-milers on CHRC saturday long runs. The moral support of the weekly long run crew, in addition to the smart route planning (including much-needed water and bathroom stops), was truly instrumental in the success of my training season. My favorite thing about the marathon was the energy and celebration surrounding the event. It was so gratifying to see the streets filled with cheering spectators – I’ve never experienced anything like it! When I was flagging in the last few miles, it felt so good to hear random strangers screaming out my name and words of encouragement. The hills! The course is definitely tougher in the second half. The Queensboro bridge was truly hellish – it was so long and tedious and my energy faltered without having crowds cheering on the sidelines. The incline on 5th avenue is also no fun. At such a late stage in the race, it just felt like adding insult to injury. Hell yeah. Next time, with knee support. Find a training plan that works for you, and take it seriously. But! Not too seriously. I made the major mistake of trying to ‘make up’ missed runs on rest days in the middle of my training, and it led to feelings of burnout and lethargy that otherwise probably could have been prevented. As race day gets closer, realize that the work has already been done. One more workout won’t make or break your race, and the best thing you can do in preparation is to treat your body and mind well. Also, keep in mind that the marathon is both a physically and mentally exhausting endeavor. Give yourself time to recover afterwards – both your muscles and your emotions need time to heal. Finally, take control of every part of the race that you possibly can control, and let the rest go. Give your race day outfit multiple test runs, try out all your fuel on long runs in the weeks beforehand, and dramatically increase your hydration! If you feel mentally prepared, you’ll be more able to address any curve balls thrown at you on race day.